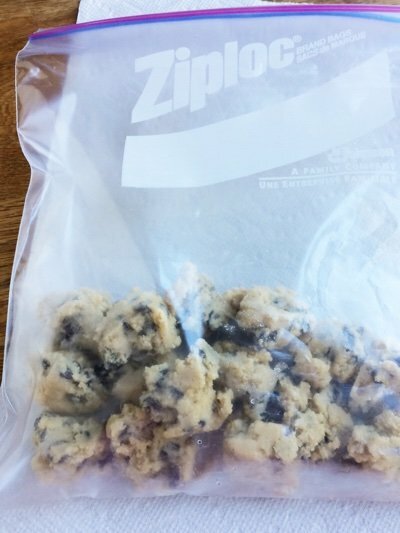 I think you need this frozen cookie dough recipe because it will stop you from eating crappy cookies. You know the cookies that I am talking about – the stale Chips-A-Hoy that someone left in the break room. If you make this recipe – I promise you will NEVER EVER EVER eat those again. The only cookie you should eat is a homemade, fresh baked cookie. This cookie is far superior to any other cookie in the universe. The problem, of course, is that when you make cookie dough and cookies you end up with a ton of them. 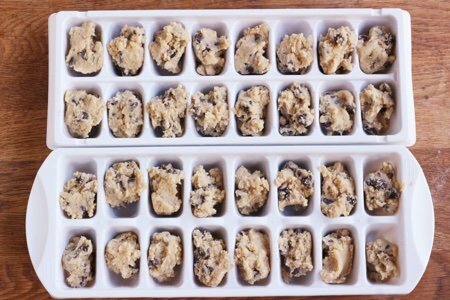 This ice cube tray method stops you from having a cookie problem and allows you to have a cookie solution. This works with my gluten-free chocolate chip cookies using almond flour for those that are avoiding gluten out there. After you make the simple batter, simply put the dough in the wells of two ice cube trays (if you don’t have any – you can find them at the Dollar Store) and freeze them. 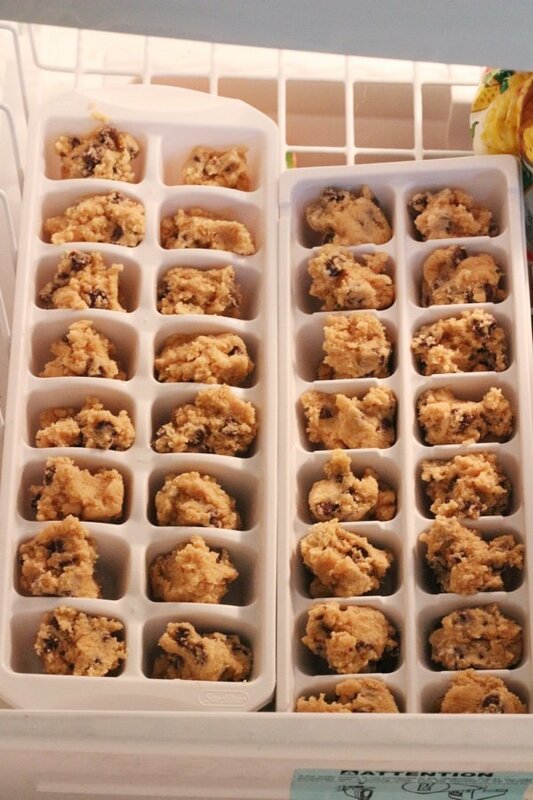 I toss them into the top tray of my freezer for about 45 minutes. After they freeze up, they pop right out of the tray and you store them in a tightly sealed plastic bag so that they don’t start to taste like the inside of your freezer. Now, you can have ONE home baked cookie (or 2). This works great if you have a toaster oven so that you don’t have to heat up the big oven for one cookie. This technique will also make you MOM OF THE YEAR because you will be serving children fresh baked cookies whenever. Yes, even I have my Martha Stewart moments of perfection when my kids come home from school. If you have an electric mixer, cream butter, sugar and egg. If you don't, just soften butter in the microwave for 10 to 20 seconds (make sure it doesn't melt) and beat with a fork. Add the dry ingredients, stir in by hand and then stir in the chips. When ready to bake, heat your oven or toaster oven to 375 F. Drop the frozen batter onto an ungreased cookie sheet, and bake for about 15 minutes. Cool on a rack for 10 minutes before eating (if you can). If you substitute Splenda or Splenda/brown sugar blend, instead of white sugar, how much would you use, and what would the estimated SmartPoints be?? Thanks! 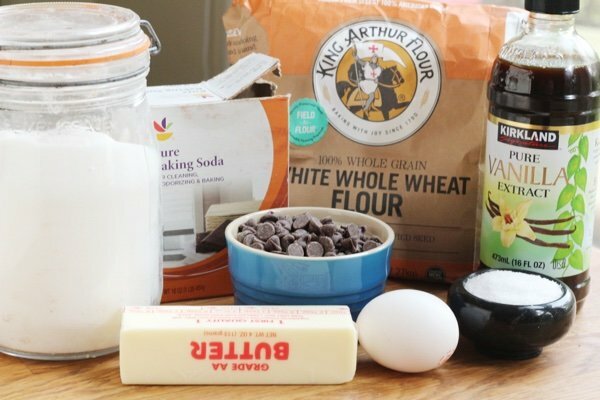 Where can I find King Arthur ww flour? Can I get it online? I live in a small town and can't find it anywhere. Might have to drive 3 hours to find it. Yum!! I'll take any lazy way that makes me look like I've made a lot of effort, lol! Thanks for the great tip! Just curious . Why should you not melt the butter ?? If someone wanted to make a bigger recipe, could you merely double all ingredients? Thx, Snack Girl, you got me @ "far superior to any cookie in the universe"! @C - I know almost nothing about Splenda. 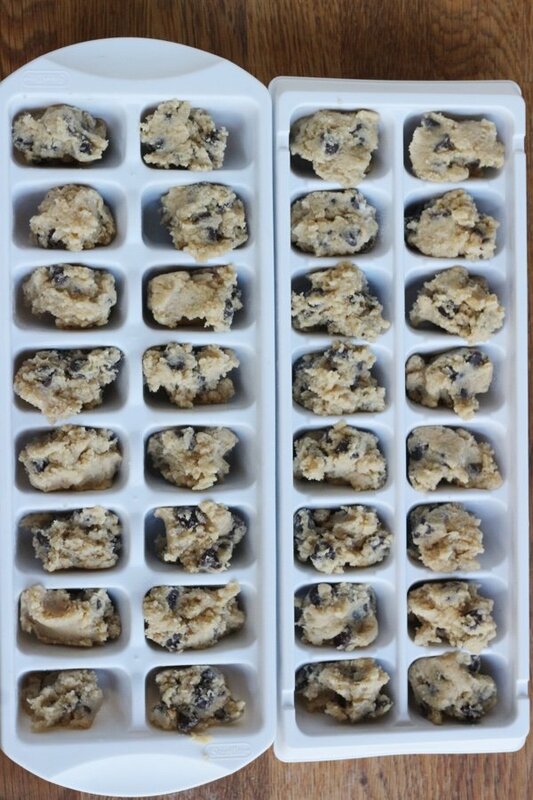 Probably go get a chocolate chip cookie recipe from them and freeze it in the ice cube trays. Sorry about that.